I am not a Simca expert by any means, but I don't believe this was called the Weekender as the seller calls it in his eBay listing. The Weekender was an earlier 1950s model. I believe this car is called the Océane. If there are any Simca aficionados reading this, please chime in. The Simca Océane was built for Simca by Facel. It came with Simca's 1300cc engine and a 4 speed transmission. Top speed was around 85 MPH. The car being offered on eBay, if it can be bought for a reasonable price, would be a very nice restoration project. The engine in this car is apart and missing the head. The seller has another Simca engine that comes with this car, but he doesn't state whether it's good, or even if it's the correct 1300cc engine for this car. The engine shouldn't be a huge concern. There were plenty of Simca 1300cc engines built and finding one shouldn't be too much of a problem (although you'll probably have to source it from Europe). When buying a car like this the big concern is body and trim parts. The seller states that this is a "rust free and accident free black plate California body (that) has been stripped to bare metal and professionally repainted". He goes on to state "the interior needs to be redone, however the seat frames, door panels, trim, and convertible top bows are all there. The car is complete, including original radio and hubcaps. However it is missing the trunk latch. The original pans, rockers, and doors are in excellent condition". This is not a "buy this weekend / show next weekend" type car, but if it is as complete as the seller says it is (This car has some pretty elaborate chrome-work around the grill, which I'm pretty certain would be close to impossible to find if it's missing) it would be a nice winter project. 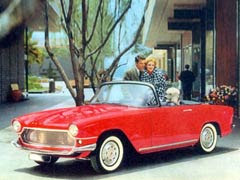 Photo from an original Simca Océane brochure. Located in San Anselmo, CA, click here to see the eBay listing for this car. The Facel Vega Club website has a short blurb about this car. You can find it here.